MANY laboratory samples are sensitive to degradation by light, presenting particular challenges in handling and storage. Made of RNAse/DNase-free black polypropylene, the tubes are fully resistant to most organic solvents, can be autoclaved, and provide high integrity storage of samples and reagents at temperatures down to -80C. 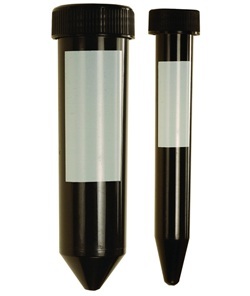 Available initially in 15ml and 50ml sizes, Asynt black centrifuge tubes are supplied sterile and include a recessed HDPE lid that prevents leakage. Each tube includes a frosted area to enable marking for easy identification.